Habitat in a good conservation status, with a compact moss layer, and many focal native species (mainly dwarf shrubs, and rosette and tussocky plants). Photo credit: Del Vecchio et al. The monitoring of biodiversity has focused mainly on the species level. However, researchers and land managers are making increasing use of complementary assessment tools that address higher levels of biological organisation, i.e. communities, habitats and ecosystems. In a recent study published in AoB PLANTS, Del Vecchio et al. 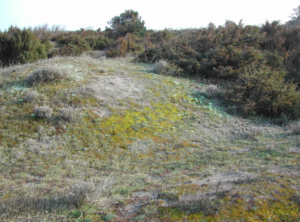 evaluated the variation in vegetation features such as species composition and structure (species richness, cover, growth forms) over time in sand dune plant communities, with the aim of testing the efficacy of different plant community attributes for the detection of vegetation quality. They found that ecological groups of species such as native focal species (species that provide essential ecological functions) and aliens (species that spread outside their natural distribution) and growth forms were effective at discriminating between habitat types and in describing their changes over time. 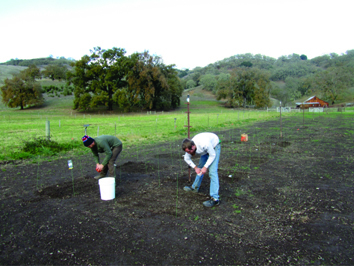 The approach used in the study may provide an instrument for the assessment of plant community quality that can be applied to other coastal ecosystems.